Gov. 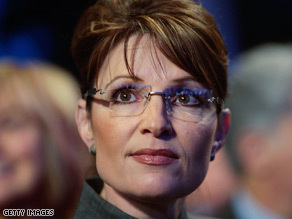 Sarah Palin will prepare for Thursday's debate from Arizona. (CNN)– Gov. Sarah Palin will now spend two and a half days near Sedona, Arizona, to prepare for Thursday's debate, instead of prepping in St Louis, as originally planned. Sarah Palin will be at John McCain's rustic creek side home outside Sedona for what a top aide calls "debate camp." The aide, who's part of the team prepping Palin, tells CNN they decided to take her to debate camp there because it is an "invigorating and enjoyable place to prepare for Thursday." "SP [Sarah Palin] loves it and has her kids and Todd coming," wrote the aide in an email. The aide said "John McCain himself came up with the idea after thinking it would be great before his next debate. Pailin has already been hunkered down for four days in a Philadelphia hotel for debate prep with advisers. She will take a short break Monday to attend a rally with McCain in Ohio, before heading to Arizona. Moderator: "So, how should we approach the economy, Governor Palin?" Palin: "Um, well, ya know it's a tough thing this economy thing. A lotta people I knooow arrrre affected by it – or so I'm told. But ya knowwww John McCaaain has said that Fanny and Freddy need to be regulated nowwww. So, I think thaaaat's whaat we should do." Moderator: "What's your view on book banning? Do you think you should have the power to pull books out of a library?" Palin: "Ummmm, well, ya know, I think thaaaat as a vice-president, that's one of the things I should get to do. I mean, there arrrrrrrrre some pretty lousy books therrrrre! I mean, if I don't like to read it, then it must be baaaad, right? Hahahahahahahaaa!" What an insult to the hardworking and intelligent women the McCain/Palin campaign wanted to attract when she was chosen for the ticket. Five schools and six years or was it six schools and five years for a 4-year degree? For once, can we have a president (and VP) who is actually smart and can make decisions without being overly muzzled by his handlers? Obama/Biden wins, because they consist of a check and a balance atop the executive branch. Where the McCain campaign has none. After watching her with Katie Couric, I don't think all the "debate camp" in the world can keep her from looking like a total idiot. It's sad that she is the perfect neocon – all style and no substance. Maybe Gidget will tells us how to filet a Coho Salmon. That will be helpful when the McCain administration brings us to financial ruin! Wow, Sarah goes to camp. Will there be any other pageant runner ups there? She is not stupid because she agreed with Obama on Pakistan. She is stupid because she does not have a clear understanding of McCain's position when it comes to foreign policy. That is why McCain had to retract her comments today. She basically made a mistake and it looks worse on her because she rarely gives interviews and because she is supposed to be more qualified than Obama, Biden and McCain according to her supporters!